Lately Tonchi has been wanting to earn his own money so that he can buy some gum! Brian and I chew gum occasionally and sometimes will let Tonchi have a piece. However, if we don’t let him have some, he often gets very upset about it. We have explained that we are sharing OUR gum with him. It is not his to demand nor is he entitled to a piece just because Brian and I are having some. For a while he was told no gum at all until he could hear us say no and not get upset about it. I understand that he is disappointed, but he cannot demand a portion. It has been a great conversation and we’ve learned a lot of concepts like the importance of sharing and also what it feels like when we think things aren’t fair. On the flip side, we told him that if he would like to have gum more often he can do some chores, earn some extra money so that he can purchase his own pack. He would still need to ask if he can have it, but he wouldn’t have to wait on us to share it with him. He liked that idea and the chore chart was born! I wanted a way that he could see what his daily responsibilities are as well as options for earning extra money. He isn’t allowed to work extra until his required chores are completed. I also wanted a chart that eventually could be used for all three kids and relatively easily expanded. We also explained to him that he will not be paid for all chores he does. We are all members of this family and there is work that has to be done in order to make family life possible and we all need to chip in and help. He is totally on board, willing to be helpful and has also been motivated to work! Success! So to make it… I originally thought of just using a whiteboard and making a chart out of it… but then I realized glass works just as well for a dry erase board! So how would I want the glass? In a mirror? or framed? with pretty paper in the back? or an old window? Old window will do!!!! My father is the KING of finding treasures that are trash to others! He found this window for me at the site of a house that was being gutted and renovated! Their trash was JUST what I needed! Thanks Dad! It took LOTS of scrubbing and probably could use a little more and a fresh coat of paint would probably do wonders, but I wasn’t really motivated enough to pull out all the stops! I cleaned it as much as I could and then finished it up. I used [amazon_link id=”B001Q4HX36″ target=”_blank” container=”” container_class=”” ]1/8” black tape[/amazon_link] designed specifically for adhering to whiteboards without leaving residue. It was only a few bucks and worked fantastic! It helps to make the lines/grid straight! I also used some black letters for their names and made sure I had a few dry erase markers. I affixed the tape to the backside of the window to help keep it clean and to make it easier to erase each week. As you can tell in the photos I ran out of tape before completely finishing so the last few lines aren’t quite as neat. It is on my to do list to run back to the store for more, but it just hasn’t happened yet and it doesn’t affect the usefulness of the board! The following chores are things that I’d be happy to have help with and am willing to pay for! A few of these are listed on their board now and then we will swap them out here and there for a variety. Also, some of them can only be done by Tonchi and the others can have the chance as they get older. We assigned compensation amounts for each one depending on how hard it was, how much responsibility it took and how much time it takes. So far our chart has worked well. The only downside is that they can’t read, so they need a lot of direction to be able to check off what they have accomplished. Tonchi has started to recognize words and lines, but Koa still has no idea. In time they will improve and long term usability is worth it. Later on down the road I may use some photos to help the younger ones with their chores…. we will see. One last thing, because it was a six paned window there was room for me to have a grocery list and a to do list for Brian. The former has really helped me to keep up with products we need or are running out of. Also Brian is more than willing to work around the house, but he often forgets what needs to be done or doesn’t have an effective list. This is visual and hanging in the kitchen! Kinda hard to miss! I’ve been thrilled to see how easy this was to make and implement! I hope you’ve found some of it helpful! What do you use? How does it work for you? I’d love to hear! 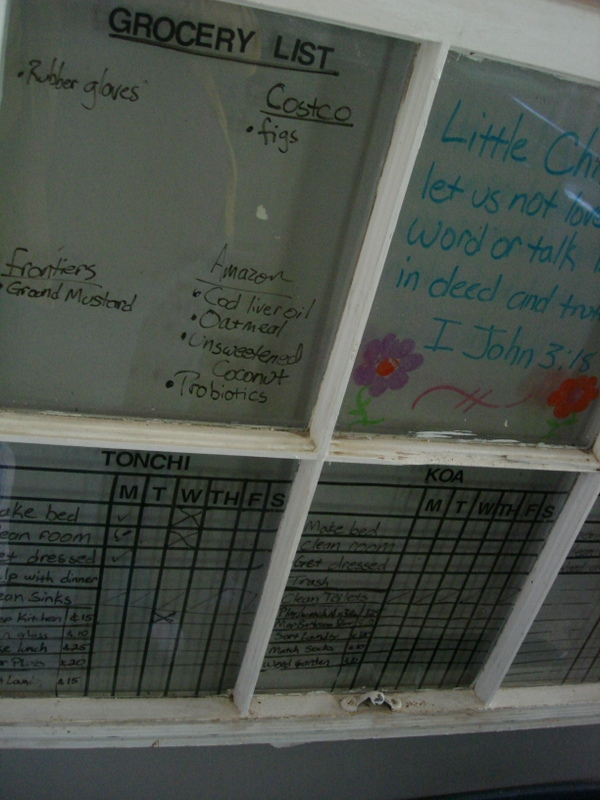 I think you may soon need a bigger window for more chores and more kids to add to your chore helper list. Let me know and I am sure I can make you a good deal like on the last window. Some unsolicited …so take it or leave it. When I had to work for a living, one job was to create chore lists and procedures for the Navy submarine program. I can not remember all the details but it broken up into 2 items, a maintenance list (your chore list) and Maintenance requirements cards (MRCSs) or your chore procedure. The MRC would be on a 5×8 card that the sailor would carry around with him to do the maintenance task. The card would have a ref number for the chore, skill level (kids name that could do the job), list of equipment and materials, and step by step procedures (your words/pictures). So that is the high level idea, more details can be provided but I think you get the idea. Most any idea will work if you keep perfecting it.